I have been looking at visualisations in relation to cities. Mainly because I stumbled across Luminocity 3d and I thought it was beautiful, but I didn’t understand it, so I had to spend some time looking at it until it started to make sense. A bit like those fractal pictures people used to have on their walls when we were students. I have been interested in data visualisations in general for some time. The main reason is that I hope that visualisations could help make the cognitive leap we need to cope with complexity. I have always been enchanted by words and narrative. But as I grow older – words fail me. Mainly they fail me because there is too much stuff around that is really, really important, that I will never have time to read about it and that makes me stressed about whether I’m going to make the wrong choices. I suspect I’m not alone in this. My oldest friend Annika Mckee has recently introduced me to the concept of heuristics, which I understand as the study of the mental wiring that helps us take short-cuts through information, which we often need to, because the information is overwhelming and only a small proportion is relevant. Data visualisations cannot be the only tool we use, if only because relying exclusively on visualisation would exclude blind and partially sighted people (I doubt that Luminocity would be understood by a screen-reader). My question is whether data visualisations could be a way to help answer some of the questions in sustainability more quickly so that we can stay away from the environmental, social and economic cliff-edge that is out there somewhere in the dark. They are increasingly part of the way that people tell stories about issues on social media. I love cities (because they are exciting, diverse and liberating) and I know that these complex systems are a huge nexus for both anxieties and manifestos of hope regarding sustainability. That cities are a ‘megatrend’ has become accepted wisdom, and as such, it should be unpacked. The challenges are well documented. Cities account for 37–49% of global Greenhouse Gas emissions while urban infrastructure accounts for over 70% of global energy use (figures from Climate Change: Implications for Cities, Cambridge Institute for Sustainability Leadership 2014). So my first question is whether visualisations can help us understand some of the sustainability opportunities around cities. There is the challenge of defining a city, and of what to say about the people who carry on living in small towns and the countryside, almost as if the fact that ‘Cities are Megatrending’ (said everyone ever writing a strategy in the last five years) is less important than having a nice quality of life and knowing your neighbours. The Metropolitan Revolution: ‘How Cities and Metros Are Fixing Our Broken Politics and Fragile Economy’ (Katz and Bradley, 2013) talks (zealously) about metropolitan areas rather than cities, defined as ‘a collection of municipalities that together form a unified labor market and is often defined statistically by the commuting patterns of its residents between home and work.’ (p2). Eurostat provides a more detailed definition. In the UK debate about whether cities like London or Manchester should have more financial powers of their own, I don’t think it has really got into the public mind yet that this might have significant impacts on people outside the city, who might or might not consider themselves in any way dependent or financially responsible for the city. So that was a bit of complexity to use to test whether data visualisation was a way to work through the question of ‘who is linked to the city’ without piling through all the statistics on the internet. I looked on LuminoCity 3D at the chart showing the flows of journeys to work. Apologies for the UK- centric and London-centric approach here, but I live and work in London , so I looked first at London and saw it defined by a new set of borders based on commutes. If you define it by the visual you see on LuminoCity 3D, then London stretches to Ipswich (Suffolk) to the East, to the Kent and East Sussex coastlines at Margate, Folkestone and Brighton, to Reading in Berkshire in the West, and Stevenage in Hertfordshire to the North. This map gives me a mental sketch that tells me that 9 counties around London have very significant numbers of people commuting to London every day. It would be interesting at some point to see whether the London Metropolitan area now extends further than the Eurostat definition, simply because the combination of house prices and okay (well, sort of okay) transport links create the market for massive commutes. You can go into more detail on LuminoCity 3D. The chart on the left hands side tells you quickly that 832,000 people commute into London from other places every day, 20% of its population of employees. That’s more than the population of Sheffield and more than 10% of the number of residents in London. But it’s not all one way. 9% of London’s employed residents commute out. I can’t tell where to, because the lines on LuminoCity don’t show direction of travel. Looking away from London, Brentwood is fascinating as nearly 80% of its residents commute out, but 80% of its employees commute in. I’d love to know how this all breaks down further. Are women or men more likely to work near home, or is that possibly something that happens for the rich and the poor, while the middle gets (literally) squeezed on the commuter trains? LuminoCity only has UK data so we don’t visualise the elites who travel globally for work, what would they add to the picture? Why do so few people who live in Brentwood do jobs in Brentwood? Is it choice, or lack of choice? Who commutes to Brentwood and where are they coming from? What does the ‘good enough’ snapshot of commuter flows across Britain tell me about cities and opportunities for sustainable business (without having to think too much)? I’d make a bet that all these millions of people moving around the country every day to get to their job is not great for our carbon emissions. There may be a huge business and sustainability opportunity for companies developing home-working and e-meeting services. Personally I believe also in the social impacts of flexi-working. Less time on a train means more time with your family, or painting a picture, meeting your mates in the pub, chatting to your neighbours or digging in the allotment. There is a new trainline proposed that will connect Oxford and Cambridge via Milton Keynes. Presumably at certain points in the timetable this will mean that Milton Keynes is briefly the most thinky-thinky town in Britain. Maybe Silicon Fen will start commuting in from little towns to the West of Cambridge. Maybe Apple should set up a new store in Milton Keynes to sell tech gadgets to the Fentrepreneurs who want to spend their leisure time browsing new smart phones. If I was Bristol or Colchester, I’d be lobbying for that trainline to be extended to me. Imagine what that East-West university highway could do to Britain. The exchange of thoughts, and wonderful R&D hubs and new businesses popping up all along it gathering and commercialising the best innovations from UK academia south of Leeds/Manchester and north of London, as well as giving Britain a new axis to distract us from the North-South divide. Barratt Homes did a study for Centre for Cities on the need for more housing around London. Well, yes, people don’t want to spend 15 hours or more a week on a crowded, unreliable train, although I find it depressing that there are no voices talking about putting more good jobs in the places where people already live. There are alternatives for small and mid-sized towns with some investment: you could turn your market square into a wifi hotspot (as piloted in my Finnish harbour-side hometown of Oulu) and let the people work from picnic tables in the summer – maybe with renewably powered device charging stations. If we could make that work well, wouldn’t that be more beautiful as well as fun and productive? But if you must build houses where the jobs are right now, rather than spread the jobs around more equally, then the type of houses and the type of communities such projects would build are huge sustainability questions. You could build an architecturally gorgeous and fully BREEAM certified housing complex but forget that the local schools can’t cope with that many new kids and have a big local rift on your hands. New businesses: is there a way to pick through this data and identify where you could find the skills and workforce to set up a new business or new branch office? Breathing new life into places, building on historic industries and creating exciting new opportunities for people. This is actually a live question for my family because himself and I want to move to the coast one day and need the economy and national business culture to catch up with our aspirations – or just get off our lazy behinds and figure out how to do it ourselves. 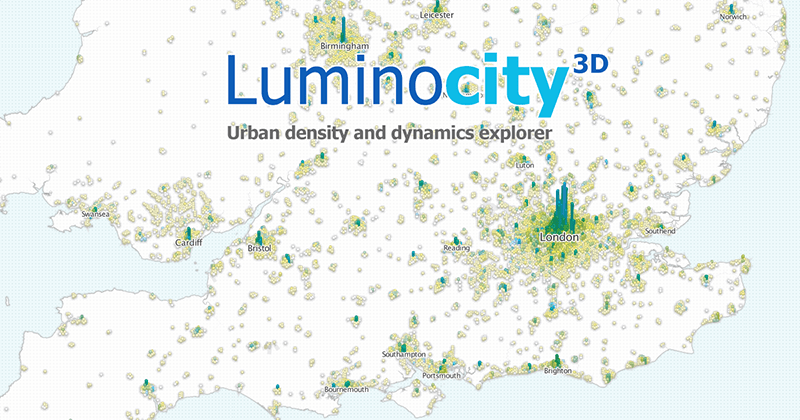 It’s clear that cities are major zones for the production of the effects that produce climate change, and it’s also clear after all this gazing at Luminocity 3D that the policy definition of a metro area has nothing much to do with the cultural image of a city. Data visualisation has helped me bridge that gap between my romantic image of London from Waterloo Bridge, and the opportunities that businesses and social enterprises may have in making metro areas into places where people can live well without compromising the lives of future generations (the core of the Brundtland statement on sustainability), or the lives of people living outside the city. Could thinking through what the mega-city looks like help us build better human-scale communities within the city, and even provide benefits to people who live at or outside the boundary of our own metro? I grew up in the Former Soviet Union and studied mathematics in Moscow. Data and numbers are not new to me. But I would not claim that I grasp it all. Some year ago, I watched the movies Rain Man and Mercury Rising. In these movies, autistic people show a lack of communication skills, but they are able to see clarity where other people only see numbers. Data visualization combines both clarity and communication. But it needs to be properly done. As a mathematician I know that it is possible to lie with mathematics and data. Visualization is important but is only part of the picture. What do we want to visualize? What is relevant and what is not? There is already a digital data overload and we need to visualize what is important and relevant. When visualizing data about cities on sustainability we should first make a list of the kind of messages we want to communicate. In my home country, which is a developing country, the messages about the key cities are different from cities of the like of London and New York. I recently received an email about the use of thermal coal and I find this interactive type of data visualization useful. Dear Emerging Markets Sustainability, thank you so much for your thoughtful comment. The visualisation you sent was very powerful, and really focuses the mind, especially when you look at the images for future consumption. Cleaning up coal is clearly a major issue. I was also interested in the film references – in themselves a great example of how visual and non-traditional formats create impact. I am meeting some people today who have explored visualisation tools in a private-academic-NGO partnership directed at helping understand risks in lower income countries and hope to find out more about such practical applications of visualisation. I am still very much at the stage of learning about the idea, so my blog was very exploratory – I am not yet at the point where I know myself how I might want to use it, or which visualisations to search out. I am also interested in the question of whether visualisations can help us figure out ‘what we want to communicate’ as well as helping us communicate it post-decision. For example, we can feel very powerless as individuals, both as citizens and consumers, in making choices. The government in the UK has done a lot in making a lot more public data available, and some businesses are reasonably transparent in the public information they make available. But visualisation may be one of the tools that help us make sense of the information in that sea (fog?) of data. You made the key point that visualisations can be deceiving too. This is really important for me to bear in mind. In my world, I am used to ‘reading between the lines’ of people’s persuasive language, and I was hoping that data and visualisation might provide a more transparent and perhaps inclusive way to communicate in some cases. But you have reminded me that visualisation may sometimes just be another way to persuade! I think your statement: “visualisation may be one of the tools that helps us make sense of the information in that sea (fog?) of data” hits the nail on the head. The challenge, I believe, is that coming up with the numbers requires different skills than visualising the numbers. How many visualisation experts are employed by government, businesses, academia, and NGOs – only a few, if any. An if so, they need to work closely together. They also need the right tools and there are a lot of data mining and visualisation tools available. (http://www.creativebloq.com/design-tools/data-visualization-712402). Hi, thanks for the link to the tools. I will try some out in my work and see if they make more of an impact on people.